Talk about a new wrinkle in outdoor action gear. Or, rather, a fold. Inspired by the craft of origami, a California-based company has created a kayak capable of being folded up and strapped onto one's back for transport. At just 26 pounds, the Oru Kayak is as easily carried as a backpack, greatly expanding any paddler's range of adventure. Simply put, the Oru Kayak is a completely water-worthy kayak. Reading, as it were, below the fold? 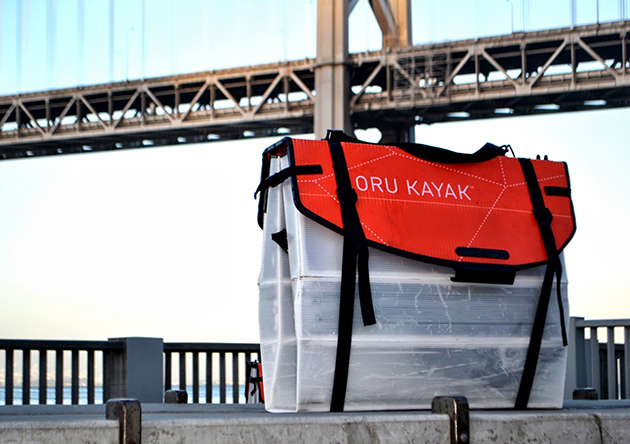 The Oru Kayak is a "custom-designed double-wall corrugated polypropylene floating device." The corrugated plastic—like cardboard in its construction, but with a 10-year UV treatment and a manufacturer rating of 20,000 fold cycles (that is a lot of kayaking)—gives the kayak a rigid body with durability. At 12 feet long with a full keel, the Oru Kayak truly feels like a kayak to the paddler. The plastic body may look different, but the ride simply feels faster because the boat is so light. Oru isn’t just a clever name. Creator Anton Willis went through more than 25 iterations of folds to come up with something portable, something with origami in its DNA. And while there are dozens of fold locations on the kayak, they all work together in three simple folding stages. Kayak becomes its own carrying case. As the product has improved, the white-hull Oru Kayak has remained largely the same, just now with higher-quality parts, improved accessories, snaps, buckles, deck rigging and more. While the first prototype of the Oru Kayak, made before the company launched in fall 2012, “wasn’t the most seaworthy,” Gutierrez says that the product he was testing handled six-foot waves with no problems. Size and weight. Willis started the process as a design solution for himself, someone living in the tight quarters of San Francisco, but who still loved the outdoors. The ease of turning a 12-foot kayak into a near-square case that can store inside a closet or get carried on mass transit truly opens up the outdoor world to more possibilities. What are the implications in kayaking? 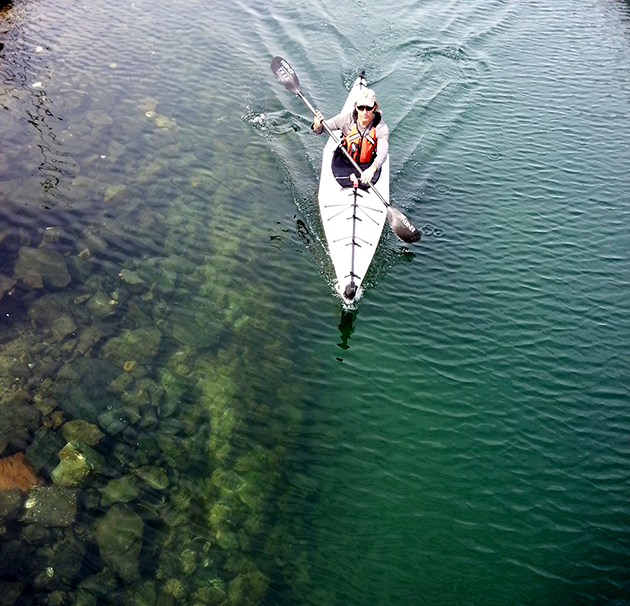 Gutierrez believes the Oru Kayak opens up the world of kayaking to more people and more places. Those who otherwise wouldn't have the space to store a boat now do. And the people who otherwise couldn’t reach a particular body of water now can. The Oru Kayak can even be taken on a plane. You have to fold the thing. But, don’t fret, it isn’t as tricky as it may look. And once you do it for the first time, it gets easier. Also, putting away the Oru Kayak proves easier than assembling it. Legally, Oru Kayak is made only for protected waters, but Gutierrez says they’ve heard anecdotally of folks having it on Class 3 rivers, in 40 mile-per-hour winds on a bay and in six-foot swells, all with no issues. Still, it isn’t designed to be a whitewater boat maneuvering over waterfalls, it is designed to cruise water. With the publicity the company gained by appearing on ABC’s Shark Tank, and with exposure on Kickstarter, the urban outdoor community has glommed onto the Oru Kayak already. What’s the future of Oru Kayak? 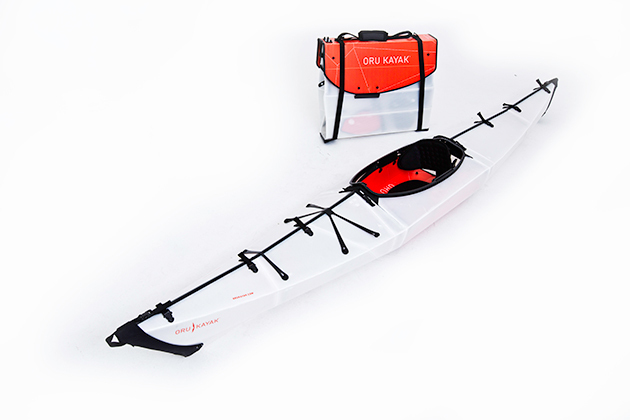 Oru Kayak is already busy upgrading the current product with more comfortable seating, more accessories and improved storage. In 2015, Gutierrez says, a new premium model and a 15- or 16-foot touring model will hit production. Foldable floatability, you might say, is the future.